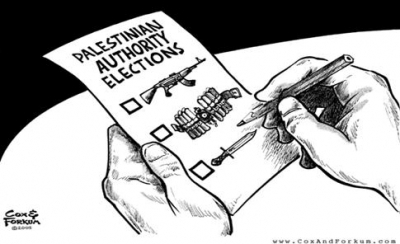 Reactions to the lopsided Hamas victory over Fatah last week in the Palestinian Authority elections divided into three. Some, like the American Israel Public Affairs Committee expressed dismay, worried about Hamas openly boasting of its goal to destroy the Jewish state, seeing this as the end of the peace process. Others, such as former president Jimmy Carter, gulped hard and defied common sense to hope that following Hamas winning 74 seats to Fatah's 45 in the 132-seat legislative council, it would be tamed and transformed into Israel's peace partner. A third group, which includes Boston Globe columnist Jeff Jacoby, determined that the Hamas success was "by far the best result" because it offers an "unambiguous reality check into the nature of Palestinian society." And me? The Hamas victory leaves me neutral with regard to the Arab-Israeli conflict. "Hamas terrorists speak forthrightly while Fatah terrorists obfuscate." Not much separates Hamas anti-Zionism from Fatah anti-Zionism except that Hamas terrorists speak forthrightly while Fatah terrorists obfuscate. Even their tactics overlap, as Fatah denies the existence of Israel and Hamas negotiates with Israelis. Differing emphases and styles, more than substance, distinguishes their attitudes toward Israel. I abominate Hamas and have called for its destruction, but I also recognize that the elections might bring benefits, prompting Israelis finally to recognize the deep and pervasive anti-Zionism in the Palestinian Arab body politic. Hamas and Fatah together won all but thirteen seats in the legislative council. A leftist terrorist group, the Popular Front for the Liberation of Palestine, got three seats; three leftist parties – Al-Badil (or the Alternative List), the Independent Palestine List, and the Third Way List – each won two seats, and four independents won seats. With the possible exception of some marginal figures, then, the legislative council wall-to-wall rejects Israel's right to exist. Or, in David Horowitz's biting description, Palestinian Arabs are "the first terrorist people." The Palestinian election outcome resulted partly from more than a decade of misrule by Yasser Arafat and his cronies, who stole, plotted, embezzled, and ran roughshod over their subjects. Hamas, in contrast, built a record of community service, relative probity, and modesty. Looked at positively, the success of Hamas implies that Palestinian Arabs do take other matters into consideration besides eliminating Israel. Looked at negatively, they merely prefer honest terrorists to dishonest ones. The strong Hamas victory, wrote Steven Plaut of Haifa University, is "the only thing that stands a chance of forcing Israelis to open their eyes and wake up." Its ascent might conceivably wake others up too; will Spain's blinkered government note the recent call by a Hamas children's publication for the city of Seville to be returned to Muslim rule? Possibly. But I hold out meager hope that Hamas-in-power will provide a reality check. The "peace process" community will not give up its cherished negotiations just because a murderous totalitarian organization has been elected. As has inexorably been the case since 1993, it will ignore this setback and press ahead for more Israeli concessions. I predict an approximate repeat performance of the pressure on Arafat in 1982-88 to renounce terrorism. But an acute observer of the Arab-Israeli conflict, Robert Satloff of the Washington Institute for Near East Policy, doubts that Hamas will be compelled even to match Arafat's concessions back then. I also expect that, despite bold statements about how it will not change, Hamas will play along with the verbal demands on it. Feeling a financial pinch and diplomatic pressure, its leaders will adopt Arafat's habit of delivering opaque hints and saying one thing in English and another in Arabic. Like Arafat, they might even "renounce" terrorism or pretend to change their Protocols-laced covenant. Indeed, what Yossi Klein Halevi calls "the era of the wink and the hint" has already begun, with Hamas largely desisting from terrorism against Israel during its declared tahdiya (calming down) in 2005, then somewhat moderating its rhetoric in recent weeks; for example, it proposed a 15-year truce with Israel. The makeover shows signs of success: former president Bill Clinton, often an opinion bellwether, has just urged the Bush administration to consider dealing with Hamas. I predict Palestinian-Israeli negotiations will resume their glorious record of bringing good will, harmony, and tranquility, with Israel this time facing a far more determined and clever foe than the blighted Arafat or the hapless Mahmoud Abbas.